Our renowned guided salmon river gift vouchers are available on the four major Scottish salmon rivers Tay, Dee, Spey & Tweed which are all open for fishing by early February right through to at least the end of September. The logistical positioning of these rivers means there's at least one salmon river reasonably close depending on your Scottish home location. 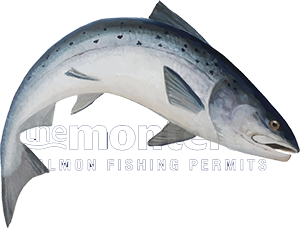 This guided salmon fishing experience is designed for both newcomers to the sport and for existing salmon fishers who could benefit from some professional fine tuning to increase their tactical understanding and success rate. The River Tay due to its central Scotland locational position is a very popular choice of venue as the Tay is within easy motorway commuting distance from the major hubs of Glasgow & Edinburgh. The Tay is also fortunate to have such a vast loch fed headwater system which always provides good water conditions. The rivers Dee, Spey & Tweed logistically cover other areas of Scotland and although shallower in nature they too are famous Scottish salmon rivers. All of our professional salmon guides are of 'time served' status and not just someone who has been brought in for the day who's not or has never been a professional Scottish ghillie. This is very important as often guides are not well enough skilled to give a guest a thorough salmon fishing education or the necessary tactical fine tuning which is vital for success. All of our professional staff are either of current 'full time' professional status or have been of professional status for at least 5 years. All of the important basic skills of how to be effective on the riverbank are taught to our guests. These skills include how to use a 15ft double handed salmon fly rod, wade correctly through a salmon pool and how to react to the take from a salmon when it happens. Other important salmon fishing skills that are taught to our guests are how to correctly 'approach' a salmon pool and how to 'read' the river to identify exactly where salmon are likely to be located which are other vital skills for success in this amazing pursuit. Follow this link for a detailed breakdown of everything that's involved in a guided salmon fishing experience on one of Scotland's famous salmon rivers. An actual salmon fishing date(s) can be agreed with the gift voucher recipient after they receive their gift voucher so no need to prebook a specific fishing date unless you'd like to. All salmon fishing equipment including chest waders, waterproof jackets & life jackets are included so all that's needed to participate is a packed lunch, sunglasses and warm clothing. If local accommodation recommendations are also required links to the best local hotel options can also be forwarded. A quality card gift voucher is available at point of booking by post or a digital version can be delivered instantly via email.